bowing technique, tone production, and intonation. Guitar: fingerstyle technique and arranging; flat-picking techniques; accompaniment styles & thinking harmonically. Mandolin: plectrum technique and tone production; ornamentation. Dan has a Masters in Music in classical guitar performance from Lewis and Clark College School of Music (1983). He studied classical guitar with Ian Mitchell, and has taken masterclasses from Michael Lorimer, Christopher Parkening, David Russell and others. Dan studied Irish fiddle with Kevin Burke and violin technique with Gary McLaughlin, Kathryn Gray, and Tina Alexander. Dan has been active as a music teacher since 1980 and has taught at Portland State University, Marylhurst College, and the Community Music Center in Portland. Dan presently teaches privately at his own studio in Southeast Portland and through Artichoke Music. 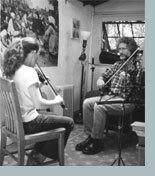 In addition to teaching private lessons, Dan gives workshops in fiddle and guitar styles and has taught in this capacity at many music- and dance-camps, including the Festival of American Fiddle Tunes in Port Townsend, Washington. Dan also teaches an ongoing class in Irish session playing at Artichoke. Dan also has available a series of Irish session repertoire CDs, originally developed for the session class. Each CD contains common session tunes played at moderate speed (with accompaniment) and then slowly. These CDs are available from the Glen Cottage catalogue page.